Those familiar with the Ford F-150 will find that the Ranger has been put to the same tests as the legendary truck. Built on a high-strength steel frame, the Ranger can handle a wide range of weather and terrain. Features such as blind spot monitoring and others help the Ranger handle towing in steep grades of terrain. Other features such as the Terrain Management System and Trail Control enable the Ranger to go wherever your adventures take you. 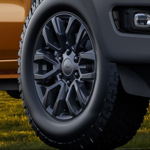 These are just a couple of reasons to be excited about the return of the 2019 Ford Ranger. If you’d like to learn more about this all-new Ford truck, we invite you to visit our team for more information.